Just Another Blog: Wreck it, Ralph. So, loved Wreck it Ralph. It isn't anything new, but everything it does, it does do very well. The film makes excellent use of its talent. John C. Reilley's performance is likeable and humorous. Sarah Silverman manages to pull off a mildly annoying, sympathetic, and entertaining character. So, she basically plays herself, but less vulgar than usual. A game like this probably could have gotten by on just the cameos of famous game characters alone. A lot of people really thought that's all they would get, but Wreck It Ralph manages to deliver an engaging story and use the myriad of game characters as set dressing rather than a crutch. The story doesn't feel either new, or fresh, but it has some original ideas that, and what isn't new is pretty classic. It's one of the best movies I have seen all summer, really. I highly recommend it. 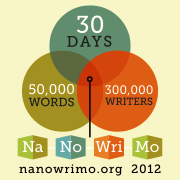 By the way, I am looking forward to failing NaNoWriMo this year.